Emir Hasanovikj applied for the Macedonia Media Leaders Program (MMLP) because he felt that media in Macedonia was in crisis—and that by strengthening his skills and networks, he could provide higher-quality information to the people of Macedonia to help them make better decisions about issues affecting their lives and the future of the country. State ownership's constricting influence, independent outlets struggling to survive financially, and widespread censorship threatened Macedonia’s independent media. Because of these factors and others, Macedonia scored an abysmal 1.57 on the Media Sustainability Index, which scores countries from 0 (unsustainable, anti-free press) to a 4 (sustainable). 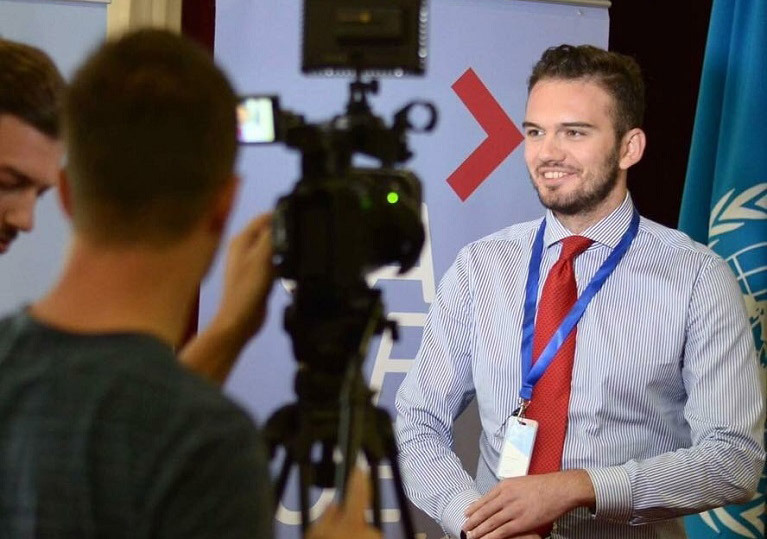 To help strengthen the media sector in the country, the Macedonia Media Leaders Program, funded by the U.S. Embassy in Skopje and implemented by IREX, has provided professional development opportunities for journalists and media professionals. During the four-month fellowship, media leaders strengthen their professionalism with media trainings, develop their leadership skills, and build their professional networks. Upon returning to Macedonia, Fellows complete a Media Pilot Project using their newly acquired skills and knowledge. Emir Hasanovikj participated in MMLP in 2016 with a diverse background as a strategic communications adviser, journalist, and digital media professional. Today, he uses the media and communications skills learned from his MMLP experience as a special advisor in the Macedonian government. During his time in the United States, Hasanovikj was placed at Fenton, a strategic communications firm in Washington, D.C. At Fenton, he gained hands-on experience researching and developing communication strategies for a variety of nonprofit organizations. He also participated in a Media Leadership Learning Series that IREX organized and instructed. This series focused on a variety of topics regarding media professionalism, such as media literacy and communicating in the age of social media. Hasanovikj notes that one of the most important lessons he learned was the power of networking. He said, “I learned how to better create networks and make connections that really benefit my growth." A notable connection was Sefer Selimi, a Community Solutions Fellow from Macedonia Hasanovikj met while in the United States. Together, they started Democracy Lab, an NGO aimed at building networks and partnerships to build, develop, and sustain a functional democratic system in Macedonia. Upon returning to Macedonia, Hasanovikj directed communications and outreach for Democracy Lab as his Media Pilot Project, the applied learning portion of his MMLP Fellowship. He developed a communications strategy and lead stakeholder and community engagement. Today, Hasanovikj serves as a special advisor for Macedonia’s Deputy Prime Minister of Defense, applying lessons learned during his MMLP experience at a governmental level. In his role, he leads communications for the Minister, handling international correspondence, writing content, and briefing her on issues. His primary focus is applying his skills and expertise in assisting to secure Macedonia’s entrance to NATO. Reflecting on his MMLP experience, Hasanovikj stresses the importance of being flexible and open-minded to adapt to a changing media environment. He notes that what made his MMLP experience valuable was the way IREX customized the program to benefit a variety of media professionals. Funded by the U.S. Embassy in Macedonia, Public Affairs Section, and implemented by IREX, The Macedonia Media Leaders Program (MMLP) focuses on strengthening the independent media sector in Macedonia. Through engaging media leaders from 2014-2018, MMLP strengthened the media professionalism and capacity of program participants through developing their leadership and technical skills and increasing professional networks of media leaders in Macedonia.